Off the coast of Fishers Island, in the relative quiet of the early fall of 2017, a bright yellow buoy with a red-and-white flag bobbed atop the cool water, following SCUBA divers along an underwater transect. The divers, scientists from The Nature Conservancy (TNC), recorded the presence or absence of eelgrass, percent cover, and canopy height – measures of the extent and condition of the island’s seagrass ecosystem – and ground-truthing the 2017 U.S. Fish and Wildlife Service’s (USFWS) map of Long Island Sound’s seagrass meadows created from aerial images. As the divers worked along the seafloor, the surface buoy, outfitted with a GPS, continuously recorded their location. In the preceding months, from May to September 2017, TNC scientists aboard a small, fixed-wing aircraft equipped with a GPS-enabled digital camera circled the island, photographing the nearshore area to evaluate vessel use around Fishers. 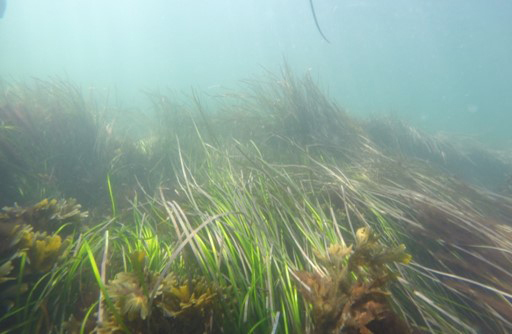 The results of these surveys are divulged in a new report, An Evaluation of Eelgrass Extent and Vessel Use Patterns Around Fishers Island, NY. Thirteen sites were evaluated by the divers, with three site surveys showing some deviation from the eelgrass extent defined in the USFWS aerial survey. Overall, the dive survey results support the reliability of the USFWS’s imaging, but the site level differences illustrate the need for higher resolution data to inform local management or project planning purposes. 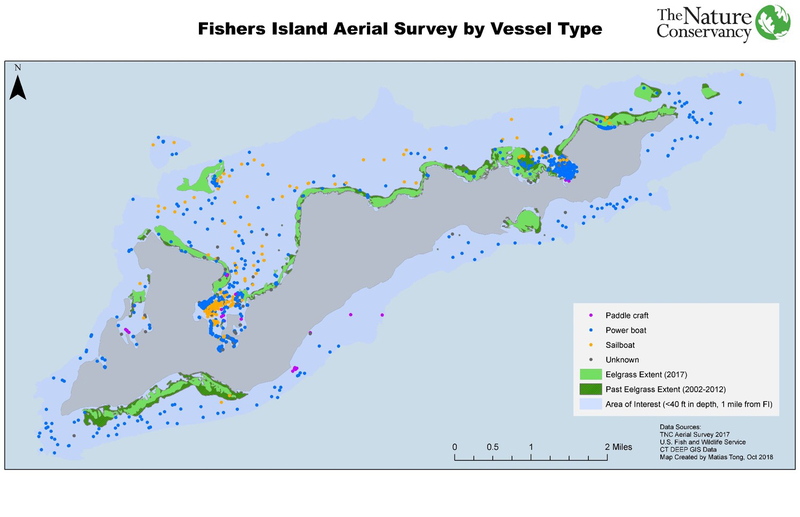 May to September 2017, TNC scientists aboard an aircraft equipped with GPS-enabled digital camera circled the island to evaluate vessel use around Fishers. Findings from TNC’s aerial survey revealed that vessel use around the island does overlap with areas of eelgrass meadows, especially on the north side of the island, and consists of a combination of recreational powerboats and sailboats. The report identifies several hotspots where high levels of vessel activity occurred over eelgrass, including Flat Hammock, East Harbor, the beach off the Eighth Hole of the Fishers Island Club golf course, West Harbor and Hay Harbor. Based on these findings, the report provides options and examples of management actions that can reduce impacts to the island’s eelgrass ecosystem, including boater education and outreach, zoning and special management areas, and conservation moorings. 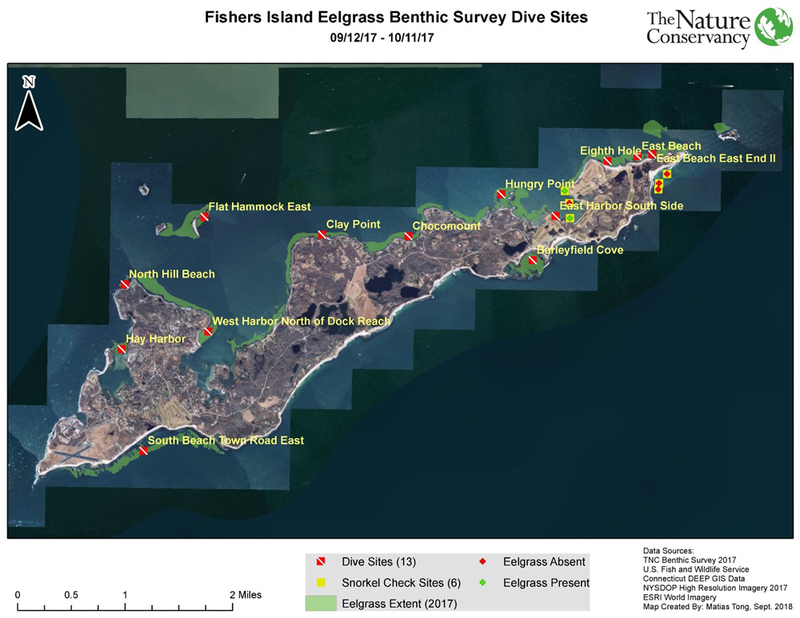 The Fishers Island Seagrass Management Coalition will be able to use these findings and other information in the report to make appropriate management decisions with regards to these fragile habitats. To learn more about the condition of Fishers Island’s eelgrass and vessel use around the island, view or download the full report on The Nature Conservancy’s Conservation Gateway. The next Fishers Island Seagrass Management Coalition meeting will be held on Wednesday, April 10th, 2019, from 1-4 PM at the H.L. Ferguson Museum. All are welcome to attend! Please contact Emily Bodell at fishersislandseagrass@gmail.com to learn more.